The MFA has been set up with the objective to promote, foster, advance, encourage, aid and develop the rights and interests of its members and the marine farming industry in general. 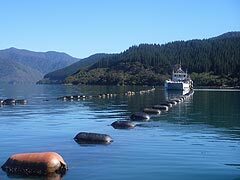 Farmers in this area of New Zealand grow approximately 80% of the marine products farmed in New Zealand. The major species include Greenshell mussels and king salmon. The Marlborough Chamber of Commerce is the organisation through which business people, professionals and concerned individuals unite to provide leadership, ideas and direction for promoting economic and social growth in the region. The Marlborough Forest Industry Association represents the collective interests of growers, suppliers and businesses and seeks to encourage the development of the forestry resource in the Marlborough region. The Marlborough District Council operates as a Unity Authority so combines the functions of both a Regional Council and a Territorial Local Authority.